Applying Wet-look Paver Sealer | America Pavers Contractors, Inc.
Our high-quality Wet Look concrete sealer adds a rich, glossy finish and satin appearance to your pavers. If you like the look of your pavers, slabs or paving stones after a rainfall, you'll appreciate the look and feel of this effective product from Techniseal. This Paver Sealant protects and brightens concrete pavers. Consisting of acrylic and plasticizers, theWet Look Concrete Sealant can be used to effectively protect and enhance your pavers and concrete slabs. 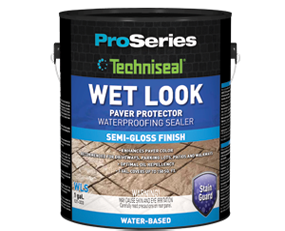 If you hire a contractor, make sure that they use this top-performing sealer, the Wet Look Concrete Paver Sealer from Techniseal. The WLS is an acrylic sealer that leaves a wet look to your pavers or other outdoor surfaces, such as driveways, patios, parking lots and pedestrian areas. Esthetically pleasing, it beautifies and enriches the original color of the pavers. 1 gallon covers approximately 150 sq. ft.
121-336 5 gallons - Covers up to 750 sq. ft.
121-333 1 gallon - Covers up to 150 sq. ft.
Coverage will depend on surface porosity. The application of 2 coats is mandatory.